On Sunday, March 15, 2015, a national protest against the corruption of the communist government of President Dilma Rousseff took place throughout Brazil. 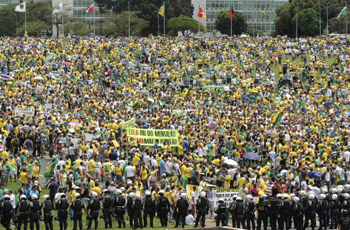 According to information from police departments of various States, almost two million Brazilians participated in the public demonstrations demanding Rousseff’s impeachment and protesting the latest graft exposure at the state-run oil firm Petrobras In São Paulo alone it was estimated there were one million demonstrators. The country is clearly facing an unprecedented political crisis. What is remarkable is that among both the defenders of the status quo and those discontent with it, there has been no intent, at least for now, to present a political alternative to replace today’s government. No one believes that switching from the PT’s rule [Workers Party’s] to another party will change anything. What we witnessed was purely and simply a protest of the people against everything in the political arena. The immediate reason for the dissatisfaction was a general disgust with the moral degradation of the government and its steady march to the left. 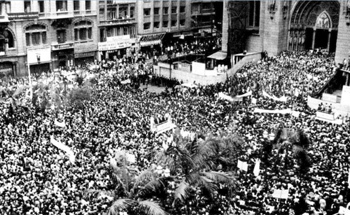 But, the political parties, even those in the opposition, did not participate in the demonstrations. They sensed that they had no solutions to present to the discontent masses. The masses themselves kept their distance from any party, since all are currently discredited and considered unable to deal with the mega financial scandals - constant last 12 years under both the presidencies of Lula and Dilma. Although the people marching were certainly inclined to the right, there was no talk of establishing a military regime, as happened in 1964. Sadly, the Church was absent in the protest. Instead, on March 12, three days before the manifestations, the President of the National Conference of Bishops of Brazil, Cardinal Raimundo Damasceno Assis, visited President Rousseff to express his solidarity and implicitly tell Catholics not to ask for her impeachment. That is to say, while Brazilian citizens, overwhelmingly Catholic, were preparing to take to the streets to protest against the corrupt communist government of President Rousseff, the Cardinal President of the Brazilian Bishops rushed to express the Church's support for that same government! Another point of contention is that ex-President Lula called out "platoons" of Stédile's MST "army" (forces of the Landless Movement) to quell the tide of protest. "I want peace and democracy, but we also know how to fight. Especially when Stedile takes his army into the streets," Lula announced. Stedile is the Marxist leader of the invaders of farms in Brazil. One unnamed journalist remarked: "What is this Stédile's army? Where are we going with this? An ex-President calls up an army a group of criminal invaders led by a man who, in any serious country, would be serving time behind bars for all his crimes. "This scorn for the laws of the country, coming from a former President, is an affront to the rule of law. Why not say that Lula assumes what everyone already knows, that the MST is a type of parallel army? And nobody takes him to court for it." Lula's declaration was widely reported by the media. In face of this bold provocation the only reaction I know of is that of a high ranking Navy official who stated: “We have only one army, that of Caxias.” Duque of Caxias, a national hero, is the patron of the Brazilian army. And the crisis continues. Every day that passes finds more news about all kinds of thefts and frauds involving high government authorities and business figures. What can we conclude from all this? Are there grounds to make a prediction about what will happen next? First of all, it is clear that not even during the period of military governments has there ever been a socio-cultural depression like the one we are experiencing today, especially in the university milieus. And despite the general skepticism of the people regarding politics, Brazilians are not as apathetic as the Europeans are unfortunately becoming. It is a skepticism that, instead of leading to inaction, raises up more and more indignation and generates protests. This reveals a new type of openness to find a different political solution, creating common ground to start a conversation. 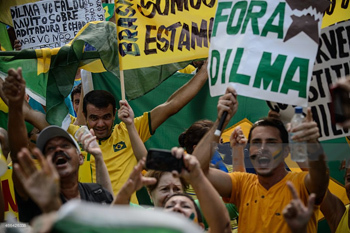 Brazilians do not expect anything from the government, the military, the Church or the media. They are looking for something different, but what? So where does Brazil go? Digging deeper into the situation, one must consider that Brazil is a country of Catholic formation and the majority of its population is still Catholic. This has a large influence on the mentality of the country. We need only recall, for example, what happened back in 1964 when the nation stood firmly as one man against Communism, which was rapidly taking over the country. The people went to the streets en masse to voice their rejection of that red advance. In face of the bold and decisive reaction of the people, the situation became ripe for the military, the episcopate, the business and civic leaders, and even the press to join together in a military coup to depose the communist government of João Goulart, nicknamed Jango. What happened? The newly installed military government began to do what the deposed communist government had failed to accomplish: It struck against the right of private property and free enterprise with a socialist and confiscatory agrarian law with the ill-fated "Land Statute" plan. This led our late Catholic leader Plinio Corrêa de Oliveira to publish an alert in the principal newspapers of the country titled "Jangoism without Jango." 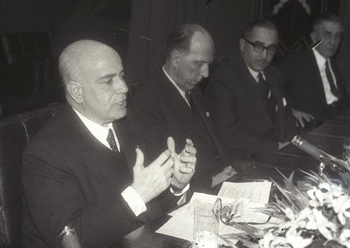 Next, the military government also attacked the sacred institution of the family by introducing a divorce bill, which fortunately did not pass, this time because of the massive and successful signature campaign led also by Plinio Corrêa de Oliveira. Those reactions against the socialist and confiscatory character of the military government were made in the name of Catholic principles. This rocky past explains in part why Brazilians are not looking for a military government to replace Rousseff’s communist one. Does this general skepticism of the Brazilian people translate to indifference about their future? We intend to answer this question in the next article. Winds are blowing in a direction that suggests that Brazil will be the target and arena for important and decisive events that will determine the direction taken by Latin America and perhaps the world in the coming years. Brazil 2015 – What Comes Next?